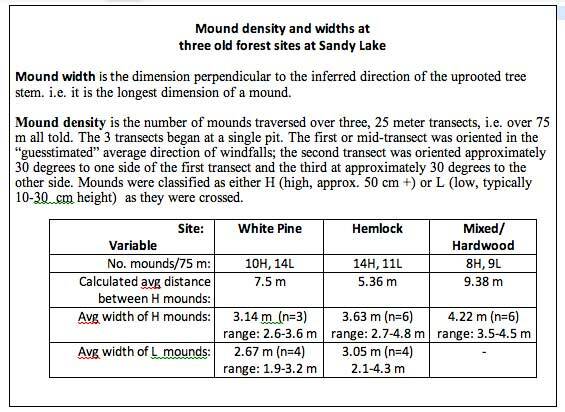 This page provides descriptive data on the pit and mound topography at Sandy Lake and Environs. View Mature/OG Forest for a discussion of their significance to the forest ecology of Sandy Lake and Environs. A “pit and mound topography” is found throughout much of the forest at Sandy Lake and Environs and reveals an ‘old process’ of development towards an old growth state interrupted by wind disturbance. It’s a process that can be seen continuing today in blowdown of big trees initiated by Hurricane Juan. These processes are especially pronounced in this forest close to Atlantic coast where hurricanes coming from the south first make landfall in N.S. In places, the pit and mound structures occur in a repeated series with the long axes of mounds oriented perpendicular to the direction of wind that blew the trees down; walking across them in the direction of the wind is something akin to swimming or paddling through a set of swells on the ocean. The mounds were formed by blowdowns of very large trees, which I estimate occurred about 150 years ago at many sites. The mounds are preferred ground for establishment of tree seedlings, and most of the big trees we see today are found on top of mounds. The pits often develop as vernal (temporary) pools, providing habitat for amphibians and other organisms requiring water for part of their life cycle. As the trees grow old and mounds erode, the tree roots are exposed creating cavities for wildlife between the roots and the trunk. His fieldwork made him an aficionado of blowdowns, and seventy-five years after Thirty-eight blew through, he could point out signs of its passing. The most common sign is the undulating ground where tip-ips (uprooted trees) transformed the forest floor. 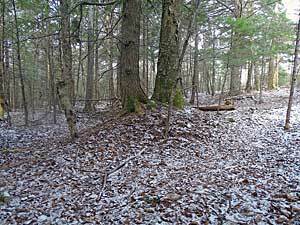 The ground in hurricane woods is poskmarked with deep depressions adjacent to correspondingly large mounds. Known as pit-and-mound topography, it looks as though somebody dug a hole and piled the dirt next to it, and it happens anytime the wind uproots a tree. The rootball of a forest tree forms a plate, and when wind knocks the tree over, the roots are wrenched out ofthe ground with only a hinge of roots maintaining it attachment to the ground, A the rest of the roots rip free, they grasp a mass of soil and stone, excavating a hole. The bigger the tree, the bigger the pit. Over time, the roots and stump decompos, leaving a mound of earth. The pit collects leaves yearly, but the decompose without filling in the hole to any grate extent. Decades after the tree went down, you can stand in the pit, look out across the mound, and that’s the direction that the tree fell. In most tip-ups, the fatal gust of wind catches the trees soil so it keels over in line with the wind direction. Using that simple guideline, I estimated directions of tree-fall (blowdown) for pits and mounds at the five old forest sites for which we had some ages of the trees, also for recent windfalls at or close to those sites. 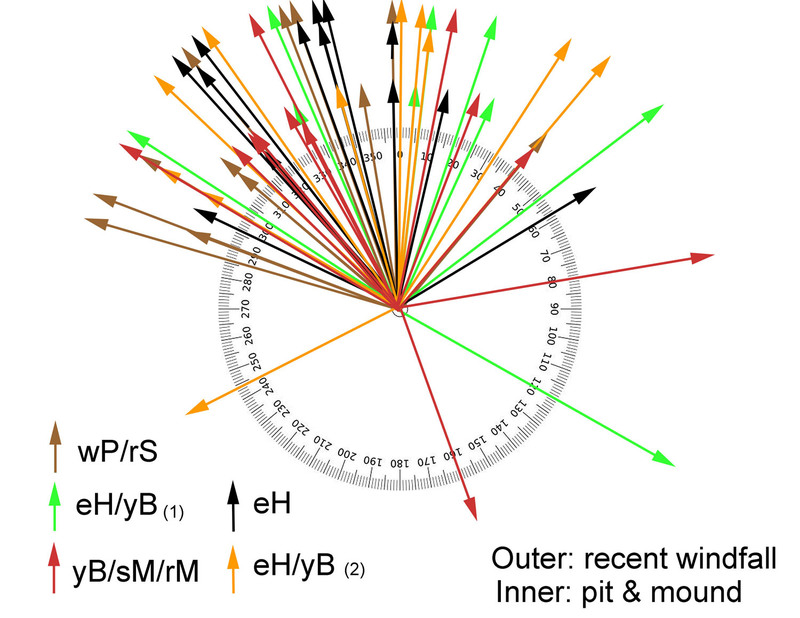 I chose only the mounds where there is still a distinct pit today, reading the direction from a Silva compass corrected for magnetic declination. I also measured directions of fall for recent blowdowns which were likely initiated by Hurricane Juan. Observations conducted Oct 20 and Nov 1, 2017. The results are shown in the diagram below. The directions are consistent with the blowdowns being associated with hurricanes coming from the south. 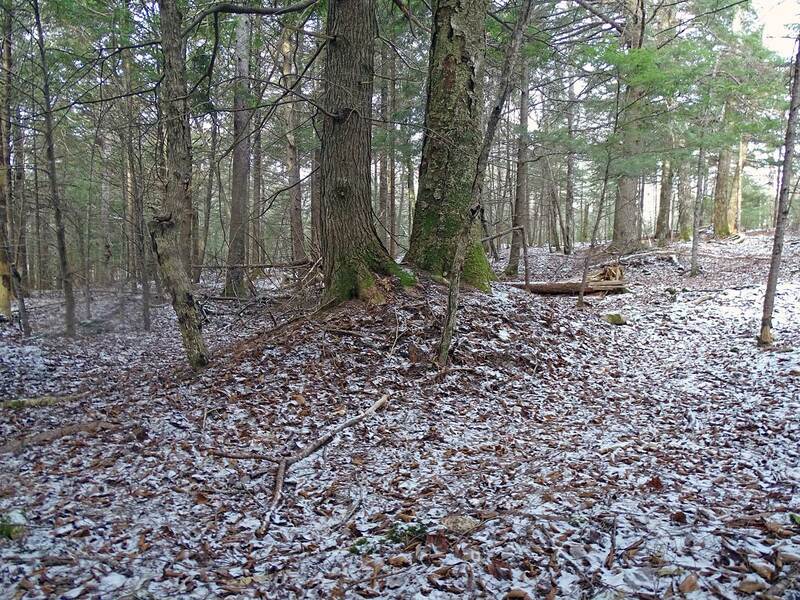 Independently, Bob Guscott, a retired DNR forester, observed very similar patterns for directions of blowdowns (with a N/NW bias) inferred for mounds in the area of Grand Lake (Oakfield, N.S.). Subsequently, we got together and refined the method for inferring direction so it could be applied to situations in which are unsure on which side of a mound the pit occurs. (View video). We also came up with a statistic for describing the frequency of mounds on the landscape (below). These are some very preliminary descriptive stats. by AR taylor et al, Forest Ecology and Management Volume 406, 15 December 2017, Pages 19-27. “The study area was located approximately 50 km east of Halifax”. Includes discussion of pit and mound topography, disturbance regimes etc.